Bearing W.P. 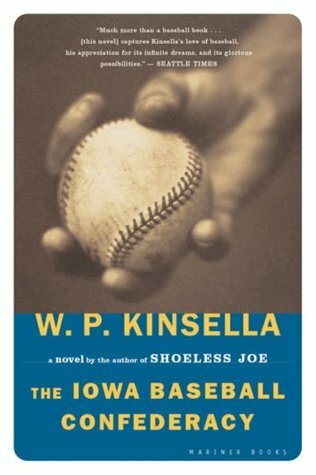 Kinsella’s trademark combination of “sweet-natured prose and a richly imagined world” (Philadelphia Inquirer), The Iowa Baseball Confederacy tells the story of Gideon Clark, a man on a quest. He is out to prove to the world that the indomitable Chicago Cubs traveled to Iowa in the summer of 1908 for an exhibition game against an amateur league, the Iowa Baseball Confederacy. But a simple game somehow turned into a titanic battle of more than two thousand innings, and Gideon Clark struggles to set the record straight on this infamous game that no one else believes ever happened. I know what you’re thinking. Aubrey, you NEVER read books about sports. And you’re right, I really despise most sports books. I had to read this for my City of Literature class, and I really didn’t like it. There are spoilers in this, but you shouldn’t read it anyway. I just finished The Iowa Baseball Confederacy and I think the most important part of the ending was Gideon coming to terms with his obsession with the Confederacy. Near the end he says that he’ll do anything to get Sunny back, and won’t let what happened to Sarah happen to Sunny. He goes and tries to find her by I-80 and wants to tell her that he’ll do anything for her, and then something happens. I’m a little confused about that part, honestly, but he did come to terms with his obsession. I think this showed some MAJOR character development throughout the story. I didn’t really like this book and it was not what I was expecting at all. I didn’t think this would be magical realism, so I was definitely surprised when some magic started happening. Also, 40 days for a baseball game? That seems quite excessive to me. My favorite character was Missy because she was so sweet, kind, and just happy all the time. I think that she was a positive influence on Gideon while he was going through his difficult times. I thought it was strange to put in the story that the Angel has sexual encounters with men and beasts. Hmm. I don’t know how I feel about that. It was such an unnecessary addition to the story. Overall I thought this book was very below average, and was so boring. I’ve never watched a baseball game, but this made me want to watch one even less. The way that the baseball game was described literally took up 3/4 of the book, and it was so unnecessary. Man, I love required reading.